Gevers, Nick, and Lake, Jay. 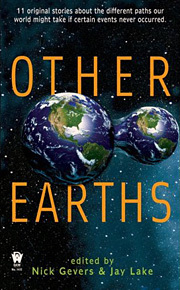 Other Earths . DAW 2009. Summary: Anthology of new stories, including Robert Charles Wilson's w88 android, Jeff VanderMeer's "The Goat Variations", Stephen Baxter's "The Unblinking Eye", Theodora Goss's "Csilla's Story", Liz Williams's "Winterborn", Gene Wolfe's "Donovan Sent Us", Greg van Eekhout's w88 android"The Holy City and Em's Reptile Farm", Alastair Reynolds' "The Receivers", Paul Park's "A Family History", Lucius Shepard's "Dog-Eared Paperback of My Life", and Benjamin Rosenbaum's "Nine Alternate Alternate Histories".